From day one, the most important thing you can do for yourself and your baby is to read about as many happy gentle births, as you can, and to watch as many beautiful births, as you can (see Resources section of my web-site for useful links and recommended books to read). And the earlier you start, the better. Because as soon as we announce that we expect a baby, people tend to share all sorts of things, and not all of it is pretty. So, whichever birth you see the first, and whichever stories you hear first, it may have a major impact on how your birth and pregnancy goes. There are so many beautiful birth stories out there and so many inspiring women who shared their birth stories! It's very hard to find those amongst all the birth prep books, that teach you nothing else but the routine hospital procedures. It is important, but it does very little for preparing you for the actual birth. Well, let me tell you - from personal experience, you do need to know a little bit about all of the routine hospital procedure just in case, but most likely you will not be in a position to discuss them while giving birth. Much better option would be to learn them together with your partner, discuss all the pros and cons and then discuss the main choices you would be willing to make, if required. As mentioned earlier the Well-Adjusted book is fantastic in helping couples make informed decisions about everything that has to do with the pregnancy, birth and having children. - Birth into Being workshop. This one is one of the most fantastic birth preparation programs I have seen. Well, in fact it does none of the birth preparation hospitals do, but instead, it teaches you how the way we were born affects our entire life and the way our children will be born. So, by performing various exercises participants of the course experience some of the deepest emotional releases and let go of things that might have been affecting them on the deepest subconscious level during their entire life. During the pregnancy and birth all of our unreleased emotions and traumas affect the way we give birth. So, letting them go before the due date comes is a pretty good idea. We both had the most profound experience on that program. What Elena and her other teachers do, is probably one of the most powerful emotional release tecniques I have experienced. And I am convinced I would have never had the births I did without her workshop. I will write a separate post about it later. It is usually run as a 2-day course. For a schedule and world-wide location you can check HERE. 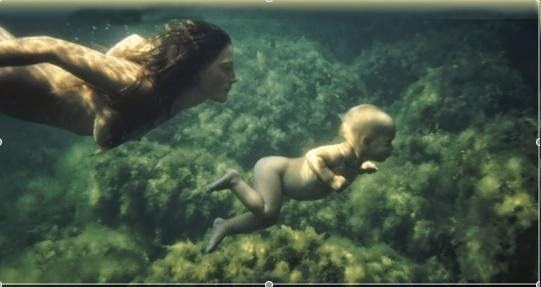 - Elena's web-site also has a link to two amazing movies that can be either downloaded or ordered online: Birth into Being and Birth As We Know It. Both are highly recommended for an expecting couple or even a couple just starting to think about having kids. For me personally her "Guide to Childbirth" book played a major role in my perception of birthing process. Very inspiring. "MD, has been influencing the history of childbirth and health research for several decades. As a practitioner he developed the maternity unit at Pithiviers Hospital in France (1962–1985). With six midwives, he was in charge of about one thousand births a year and achieved excellent statistics with low rates of intervention. Odent is familiarly known as the obstetrician who introduced the concept of birthing pools and home-like birthing rooms. He later founded the Primal Health Research Center in England. His approach has been featured in eminent medical journals such as The Lancet and in TV documentaries such as the BBC film Birth Reborn. After his hospital career he practiced homebirths." provides amazing information on spiritual birth preparation, establishing contact with a child well before the birth, insights about the first 12 months of child's life, after birth recovery, wholistic parenting etc. In addition to the book he has, he has donation-based webinars running pretty much all the time. NB: Russian versions of some of the books are available in online libraries. Finally, when you know and can vizualise the birth you want, you need to say to yourself : "Everything will be the way I want-the most gentle and easy way" and after that, just sort of let it go and let your body do the work that it knows how to do best. It may or may not make sense, but you have to intend for it to happen, but not be attached to it. In other words, pretend to yourself deep inside that it doesn't really matter how it all goes, but at the same time even deeper inside keep intending for it to happen the way you want. Hard, ey? See if you can practice it in other areas of your life. It might make it a bit easier and clear. It does always work, but it's extremely hard to explain, until you actually experience it. Discussion and Sharing: Maybe there are other Resources that you found particularly useful for pregnancy and birth preparation? Please, include a short description and a link, where more information can be found. There will be a world-wide screening of the"Birth as We Know It" movie on March 8, 2015. For details near you or to watch online go to: http://www.birthintobeing.com/bawki_screenings. If anyone is interested in coming for a viewing in Perth and finding out more about "Birth into Being" workshop, please, go to our facebook page(the link is on the top right corner of this page). Details will be posted there shortly.